The perfection and effectiveness in the best version – Nanoil Hair Oil. Learn the porosity of your hair and choose one of the three versions that ideally matches your hair needs. Remember that the best hair care pays attention to hair structure. It delivers shine and softness but also works inside the hair, scalp and bulbs. Therefore, it provides double action: it can work as an intensive repair treatment or a lightweight beautifying oil. Every version of Nanoil Hair Oil is composed of natural oils rich in Essential Fatty Acid, vitamins and extra substances e.g. boosting hair growth. That is why the price of Nanoil is competitive! … is the effect of the components that – thanks to the properties and content of fatty acids – match hair of different structure. As a result, Nanoil Hair Oil has the ability to work in the deepest keratin fibers. It does not mean that it works only inside the hair. Nanoil also smooths the external structure. It covers your hair with a protective layer and turns your hairdo around in just 30 days! Each of the three oils provides complex action yet focuses on different problems. Why? Hair types of different structure need support aimed at their precise problems. What does it mean in practice? Nanoil For High Porosity Hair reconstructs damaged hair structure, enriches with keratin, reduces hair loss, frizz, dryness and dullness; hydrates and strengthens. Nanoil Hair Oil concentrates on the protection of hair that is exposed to the harmful sunlight, toxins, etc. It speeds up blow-drying, facilitates styling and keeps your scalp healthy. The scalp is where hair bulbs (needing nutrients and moisture) and sebaceous glands (responsible for making heavy and straight hair greasy) are situated. 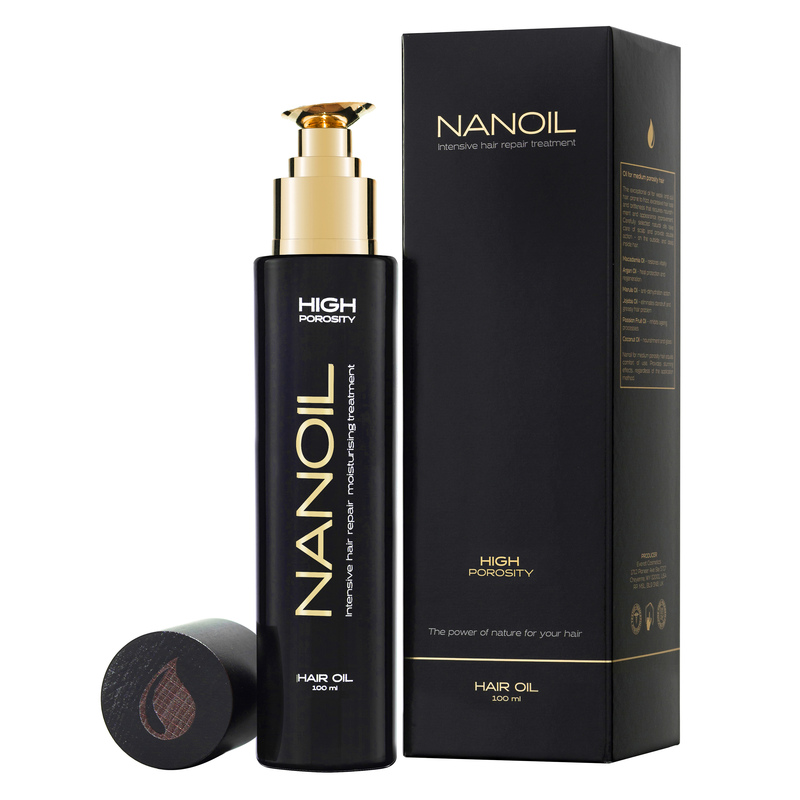 Nanoil Hair Oil controls scalp pH and reduces sebum production, which may lead to minimizing dandruff. It strengthens weak hair fibers, nourishes the bulbs, rebuilds damages in hair structure and improves the hydro-lipid protection on the surface. There is no other oil-based product providing such an intensive hair repair. There are no split ends, damaged or brittle hair when you use Nanoil. It delivers all necessary nutrients, increases elasticity and speeds up hair growth. It works before washing as a nourishing treatment or after washing as a styling primer. … offers the best selection of natural oils matching hair porosity. Each version of Nanoil contains the highest quality natural oils with a given quantity of fatty acids. That is why Nanoil For Low Porosity Hair includes plant butters and oils rich in saturated fatty acids whereas Nanoil For High Porosity Hair conceals a majority of omega-3 and omega-6 fatty acids. Every substance has been included on purpose. Each formula contains additional active ingredients that intensify the effects. Nanoil Hair Oil is silicone-free and paraben-free, all-natural. 9 in Nanoil For Low Porosity Hair (Pine, Coconut, Argan, Castor, Shea, Maracuja, Babassu, Monoi, Cupuacu), 6 in Nanoil For Medium Porosity Hair (Macadamia, Argan, Marula, Jojoba, Maracuja, Coconut) and 6 in Nanoil For High Porosity Hair (Almond, Argan, Evening Primrose, Avocado, Maracuja, Cottonseed). Kerastim anti hair loss, Baicapil for hair growth. … is a lightweight and excellently absorbed product. It seems obvious, considering such properly selected ingredients. All the components match hair porosity and that is why Nanoil works so effectively and doesn’t sit on hair. It easily penetrates the hair, leaves a velvety protective coat and enhances the appearance after the very first use. Moreover, it has the most beautiful aroma that delights with freshness and delicate fragrance note. … do not exist, which is a huge asset. You can apply Nanoil just the way you like, depending on your needs and amount of time you can devote to hair care routine. Feel free to apply Nanoil to dry or wet hair, before or after washing, for heat protection or fixing a hairdo. It works for hair oiling in a bowl, overnight oiling or hot oil treatment. There are as many possibilities as there are ideas. Thanks to the naturalness, Nanoil Hair Oil can be applied quite often and even to the scalp. The regularity and continuity of applications are important in Nanoil treatment. If you decide to use it with every washing, stick to it! … delights with elegance. There is no point in elaborating… you just need to see it. The dark glass bottle protects the liquid from the harmful sunlight and spilling. It is made of solid, unbreakable material. The bottle with golden elements and a natural wooden cap is very presentable. The wide pump allows for a quick and easy dosing.